Much of what we take for granted as Anabaptists has already been lost to the young generation and needs to be brought back to the table. by Pastor Jacob Enns (Leamington). 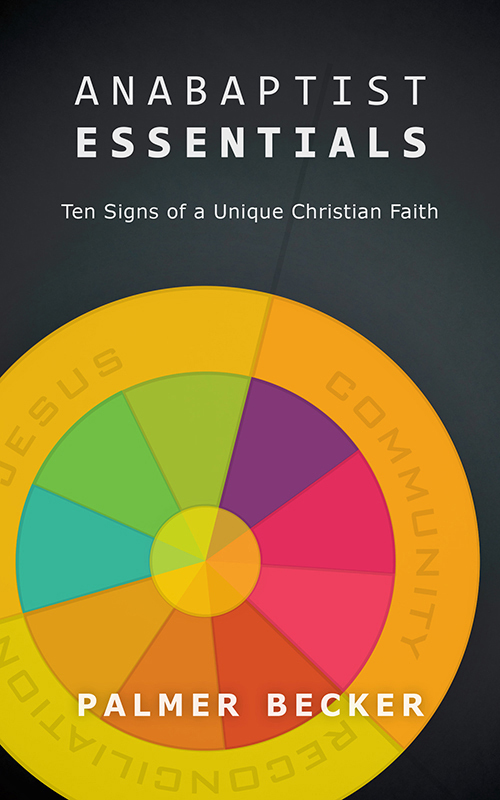 Anabaptist Essentials: Ten Signs of a Unique Christian Faith, Palmer Becker (Herald Press, 2017). 180 pp. $12.99 USD (paper). ISBN 9781513800417. In a time when culture seems to increasingly dissect and compartmentalize faith and practice, a message of faith and life integration is welcome. Palmer Becker in his book, Anabaptist Essentials, gives a very clear picture of what Anabaptism is at its core, where it is different from, and what it has in common with other protestant and catholic faith expressions. From reading his book I have come to the conclusion that much of what we take for granted as Anabaptists has already been lost to the young generation and needs to be brought back to the table. The book is not written for the purpose of pointing out flaws in other faiths. Palmer focuses on giving a very detailed rationale for the Anabaptist distinctives, and about the social and cultural impact they have made in various places and times in the past and are still doing today. It was these Early Church distinctives that the 16th century Reformers rediscovered, took as their own, and lived by often at great cost. In a Christianity where people can decide to be “saved” but not serve Jesus as Lord, Palmer points back to the life of early Anabaptist faith where there was no such separation and compartmentalization. It was either people were “followers of Jesus” or they were not. To be saved, but not serve Jesus was not part of their understanding. In Anabaptist faith, faith means obedience. Faith and works cannot not be separated and compartmentalized. He mentions that his father was perplexed by the question, “Are you saved?” His answer was: “I am a follower of Jesus Christ.” It was all one unity. He was baptized on that confession of faith. At a time when personal autonomy is gaining ground, the Anabaptist view draws people together into community in all aspects of faith expression, from Jesus being the central focus of our love, and radiating that outward to serving one another, being accountable to, and holding one another accountable, sharing ourselves with one another, and even suffering for one another. I suggest this as a good resource for Sunday School classes and small groups.